To buy crypto with fiat, choose the currency you wish to deposit (USD and EUR available) from the drop-down menu in the “You send” field and type in the amount to send. Then choose a currency you wish to buy from the drop-down menu in the “You Get” field and the service will automatically calculate the final amount with the best exchange rate. If everything is OK, click on the “Exchange” button. At the next step type in your email address for identification. The reason we ask for your email is because our partner needs to track the limits of buying and selling your coins with fiat. Learn More. Type in your wallet address in the “Enter the recipient’s address” box. Click “Next”. If you don’t have a wallet address, click on the “Don’t have a wallet yet?” section and create your wallet with one of our partner services. If necessary, you can also add an extra id, destination tag or memo. Learn more. Check all the information carefully and click on “Confirm”. You will be redirected to a secure payment company webpage to proceed with the payment. Type in your phone number and click on “Next”. Type in your date of birth and click “Next”. Type in your debit/credit card information into the corresponding fields. Click “PAY”. Check all the information carefully and click “Confirm”. When you use your debit/credit card for the first time you need to go through a video verification. 1. 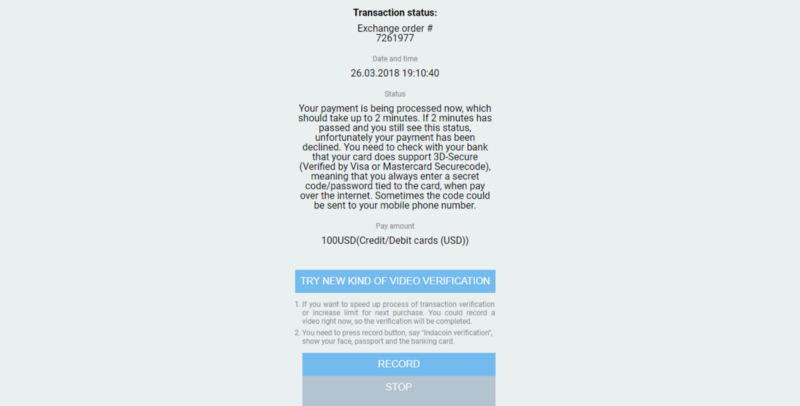 You need to face the camera, click on the record button, say “Indacoin verification”, showing to the camera your ID/Passport/Driver’s license together with the bank card (we ask only for the last 4 digits and the name on the card). Full verification with a passport and a bank card is only required for users from the UK and Israel. 2. Click on “Stop” and then on “Send”. Once your payment is completed you will be redirected to ChangeNOW. ChangeNOW will finish the exchange process and your coins will be sent to you in a few minutes.